The rules for Just For Fun Reads say no review necessary but I really liked this one and want to tell you about it. Note – Make sure you have chocolate handy while reading! This series blend two of my most favorite things – BOOKS! and CHOCOLATE!! Michelle Serrano and Erica Russell have opened Chocolates and Chapters combining a bookstore with a chocolate shoppe. What could be better? West Riverdale, Maryland is the place to be for Memorial Day Weekend. The town is hosting an Arts Festival and a Fudge Cook-off. Michelle and Erica have been basically volunteered by the mayor to run the entire cook-off and they are on the general planning committee for the Arts Festival as well. Their friend Denise, a photographer, is also involved. She is waiting for her big break. She hopes to have a gallery showing of her work in D.C. soon. Her dreams turn to dust when she is found dead, apparently poisoned by Michelle’s chocolate truffles. Michelle is obviously the first suspect but the evidence quickly starts to point to Erica’s brother-in-law. Faced with having their store shutdown until the killer is found Michelle and Erica start their own investigation not just to save their shop but to save the Memorial Day celebration too. Kathy Aarons does a great job introducing us to all the characters for this new series. There are quite a few and fleshing them out enough for the reader to become engaged is not an easy task. There is plenty of room for them to evolve is future installments. She has also whipped up quite a mystery sprinkled with plenty of diversions to keep us readers guessing. I was speechless as I reached the end. I am truly looking forward to getting to know these characters much better. The next book in this series, Truffled to Death, is screaming at me from the shelf so I will be reading it very soon! I agree, mention books and chocolate and I’m in. (Thrown in a Beagle, and I’d have to get up off my sickbed, go find a bookstore and buy this.! 🙂 ) Going to put it on my wish list. Mmmmm – books and chocolate – heaven on earth 🙂 That TBR list keeps growing and growing. Yum! 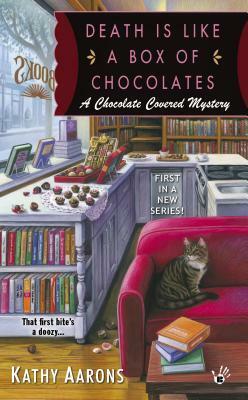 This book is on my TBR and I definitely would want to have chocolate handy. Though of course I always want to have chocolate handy! Cozy Wednesday with Terrie Farley Moran – Author of Caught Read-Handed – Giveaway too! Great Escapes Book Tour – Trawling for Trouble by Shelley Freydont – Review & Giveaway!